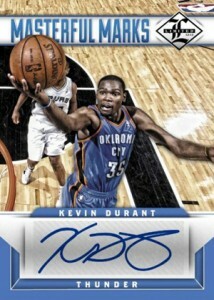 2012-13 Panini Limited Basketball heads in a new technology-driven direction. Both the base set and inserts show signs of something different and refreshing. The 250-card set includes 100 autographed rookie cards. While that might not sound too drastic, each of the rookie cards are printed on acetate and die-cut in the shape of the NBA's Rookie of the Year trophy. 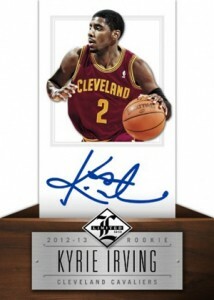 Rookie autographs are numbered to 399 or less and include players from both the 2011 and 2012 NBA Draft. Checklist highlights include Kyrie Irving and Anthony Davis. One rookie autograph comes in every pack. The 2012-13 Panini Limited Basketball base set has three parallels: Bronze, Silver and Gold. Besides the autographed rookie, seven-card boxes come with two additional hits. Home & Away includes swatches from both types of jerseys. What makes the dual-sided cards unique is that collectors can spin the card to reveal the different home and away jersey pieces. Glass Cleaners return to highlight the NBA's best rebound kings. The cards come with several different versions that add autographs and game-used memorabilia to the mix. Other autograph sets in 2012-13 Panini Limited Basketball include Unlimited Potential, Masterful Marks, Spotlight Signatures and Material Monikers. Lights Out focuses on the game's best scorers. Each card includes a piece of game-used memorabilia. 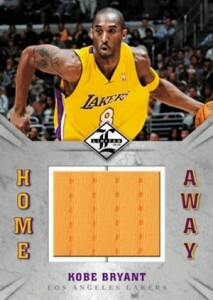 Good: Five-card pack of Kobe Bryant Anthology in each box. Two autographs and one game-used card per box. Amazing look to acetate die cut autograph rookies. Innovative feature for Home & Away Jerseys with rotating swivel containing two different colored swatches. First basketball card of James Harden in a Houston Rockets uniform. Bad: Only seven cards per box. Tough to complete 150-card base set with only four base cards per box. Some autographs are stickers. Base cards are prone to chipping and dings on edges. The Bottom Line: 2012-13 Panini Limited Basketball is a mid-end product that currently costs around $95 a box. This box can either yield you an amazing high-end hit or several low-end hit cards that might make you feel like you wasted your money. Even though the many different card designs are appealing, it does not warrant an immediate reaction to buy a box. The base cards for Limited are made of thick card stock and have a similar design to last year's iteration. They are prone to dings along the edges of the cards when pulled from the box. One of my favorite things about the base cards are that every single player that changed teams during the off-season are showcased in their new uniforms. This was not the case on the last several Panini basketball products as some players were still shown in their old jerseys but had their current team logo and name on the card. There are no basic inserts in this product, but parallel cards are present in Silver, Gold, and Platinum versions. The real highlight of this product are the amazing autograph and memorabilia cards. The Home & Away Memorabilia cards have a swivel that rotates two different colored jersey swatches. This is a very innovative and neat feature. The only downside is that rotating between the swatches too many times may cause the swivel to become loose and ultimately ruin the value of the card. The majority of the autographs in this product are stickers, which is a shame since the Masterful Marks and Unlimited Potential Autograph Sets are designed perfectly for an on-card signature. The base rookie autographs look absolutely stunning on the acetate die cut background. The best part is that the autographs are signed directly on the card. The mantle on the bottom of card design makes the card stand out more. This is a genius idea for a card design that Panini gets top props for. 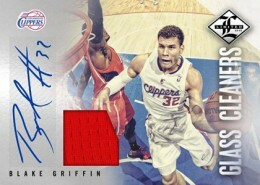 The 2012-13 Panini Limited Basketball base set is comprised of 150 base cards. There are 100 rookies autographs from both the 2011 and 2012 NBA Draft classes. This product will be a real challenge for set collectors since you only get 4 base cards per box. Base set prices are going to go for a premium since, theoretically, someone will have to bust at least 38 boxes to get all 150 different base cards. There is a nice mix of veterans, rookies, and Hall of Famers in this product. Many top-name retired players have autographs including Kareem Abdul-Jabbar, Magic Johnson, David Robinson, John Stockton, Anfernee Hardaway, Dikembe Mutombo, and Yao Ming. Although hovering around $100 per box, 2012-13 Panini Limited Basketball boxes have just seven cards. You get two autographs and one memorabilia card per box. This product can be very hit or miss, depending on what you pull. Even though the card designs for the rookie autographs and Home & Away Memorabilia cards are superb, there is a good chance that you can pull all low-end hits in your box. 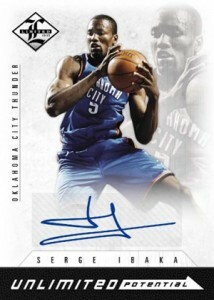 2012-13 Panini Limited Basketball boasts some of the nicest autograph and memorabilia card designs I have seen in the past few years. With each new release, Panini has been vastly improving their products. Like all Panini basketball products this season, collectors get a five-card pack of Kobe Bryant Anthology cards and the luxury of pulling rookies from two different years. The rookie autographs in this product are top-notch and definitely a huge selling point. Hopefully we see a similar design in next year's release. 2012-13 PANINI LIMITED ISAIAH THOMAS RC AUTO 199 CAVALIERS CELTICS ! 2012 13 PANINI LIMITED HOBBY BASKETBALL 2 BOX LOT 4 AUTOS - KAWHI LEONARD AUTO? 2012-13 Limited Factory Sealed Basketball Hobby Box Kyrie Irving RC?